I am ashamed and embarrassed to be a journalist. This past week’s coordinated attacks on so-called fake news sites—largely orchestrated by the mainstream media and supported by Internet gatekeepers like Google and social media consorts such as Facebook or Twitter—is nothing less than an assault on free speech by organizations that should protect it. They blame so-called fake news sites for influencing the 2016 Presidential election in favor of real-estate mogul Donald Trump and seek to extinguish them. But the Fourth Estate really responds to a perceived threat that looks to upend the mainstream media status quo. More appalling is the rampant advocacy journalism wrapped in cloak of objectivity from news orgs like the New York Times and the Washington Post. Meaning: Anti-Trump editorial policy and reporting slants are as biased as the labeled fakers. Worst of all: Many, if not most, media outlets fail to acknowledge, if even see, how they failed the American public during the campaign. Their accusations should point inwardly, not outwardly to other information disseminators. So there is no misunderstanding: I am not a rabid Trump supporter, but a journalist who separates personal sentiments from my ethical responsibilities. More of my peers should do likewise. The first question anyone should ask: What is fake news? The second: Is it free speech? BBC offers best answer to the first, authoritatively and without the pro-status quo bias evident in recent reports from many other news orgs. My definition: Any information presented as news that: purposely or unintentionally misleads; is factually flawed; or is advocacy cloaked as objectivity. An astonishing amount of so-called news from the mainstream is little more than gossip, or clickbait, and therefore meets my criteria for fake news. If traditional news orgs can spread fake news, or practice what I define as advocacy journalism, and be protected as free speech, so should so-called fakers be allowed the same rights of expression. They aren’t different but the same, particularly during an election cycle where 229 daily and 131 weekly news publications endorsed Hillary Clinton for President. Once a newsroom advocates a position for one candidate over another, and the reporting is more aggressively negative to the other, the content is unreliable. Its accuracy cannot be trusted. If that isn’t similar, or the same, as so-called fake news, particularly that which stumps for Trump, my name is Hillary Clinton. Glad to meet you. Many of these Clinton endorsers continue to advocate against Trump, following the election, although tone is softening nearly two weeks later. Such editorial bias is shameful and disgusting, and it prostitutes the Fourth Estate’s fundamental responsibility to reveal truth in the public interest. 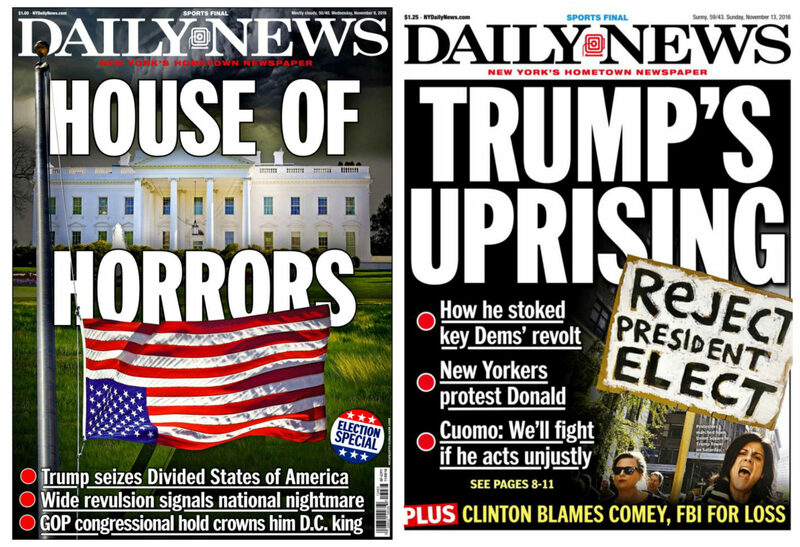 The Trump distrust and hate that these newsrooms promote undermines the Republic, which is ironic since many of them assert that the President-elect is a prejudiced hate-monger who will destroy the country. You do see the irony, right? 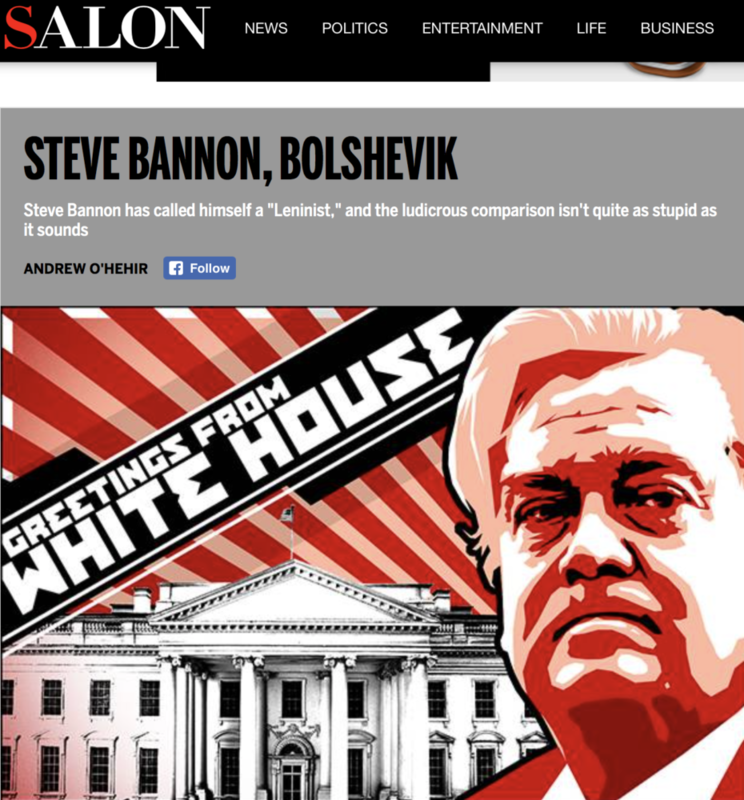 Salon top-story early on Nov. 19, 2016 attacks CEO of competing Breitbart News. Salon appears to be on a crusade against Trump. Two headlines this fine Sunday: “Autocratic for the people: As Donald Trump’s populist wave recedes, an authoritarian regime in the making is revealed“; “Dear hard-working white people: Congratulations, you played yourself“, with dek: “Donald Trump’s not bringing back those imaginary factory jobs—so I hope racism keeps you warm at night”. You can call these news stories editorialization, advocacy journalism, or both. Here’s a hed from Slate: “Government by the Worst Men“. With dek: “Donald Trump’s appointees represent a coherent ideology and perspective, one that should terrify all Americans”. At the bottom of the page, promoting the site’s Plus subscription service: “Slate won’t normalize Trump. Help us make him accountable”. Oh yeah? By writing overcharged, editorialized news stories slamming him before he is officially confirmed to office (by the Electoral College) or sworn in as 45th President? Mr. Trump is deeply ambivalent about becoming President. He’d rather stay in his lavish New York penthouse. Policy is a headache. It requires concentration. There are annoying laws against nepotism. It all began as a game, turned into an ego trip and ended in a strange apotheosis…I see a high chance of disaster within the first year of the new presidency. Trump won the game. But now the game for him could be up. Or perhaps the world will go down in flames. Eh, how does the author know what Trump thinks? One more, from Vanity Affair: “Trump Family Mafia Executes ‘Stalin-eque Purge“. There are no loaded connotations in “Mafia” or “Stalin”, right? Looking at these headlines from the mainstream, do they seem all that different from these alleged pro-Trump fakers that posted during the campaign: “Does Hillary have a BODY DOUBLE? Bizarre conspiracy theory claims the pneumonia-stricken candidate has been replaced by a lookalike“; “Donald Trump Protester Speaks Out: ‘I Was Paid $3,500 To Protest Trump’s Rally'” (from a fake ABC News site)”; “Pope Francis Forbids Catholics From Voting for Hillary”. What all these—and current mainstream news stories like them—share in common: They are character assassinations. So-called fake news, much of it partisan, is necessary free speech when the mainstream media is so bent out of shape about Trump. Had Hillary Clinton won the Presidency, do you really think we would see headlines like the New York Daily News “House of Horrors?” Would major dailies splash about conflict-of-interests from the Clinton Foundation or press Watergate-style investigations into her missing emails? No. They would give her deference, like Barack Obama eight years ago. There would be glowing reports about America making history by electing the first woman as President; analyses about how her leadership style might differ from a man, or her husband—a former President; studies comparing her past roles in the White House, as First Lady and Secretary of State, and what they reveal about her future domestic and foreign policies. If you take the recent vocal outcry against so-called fake news at face value, there is behind it righteous indignation—the Fourth Estate seeks to protect the public from falsehoods. I have to laugh. News sharing, whether regular folk or so-called fakers, across social networks undermines the authority of the mainstream media and, more destabilizing, robs revenue in a market of fixed advertising spending. That makes any accusations highly conflicted. 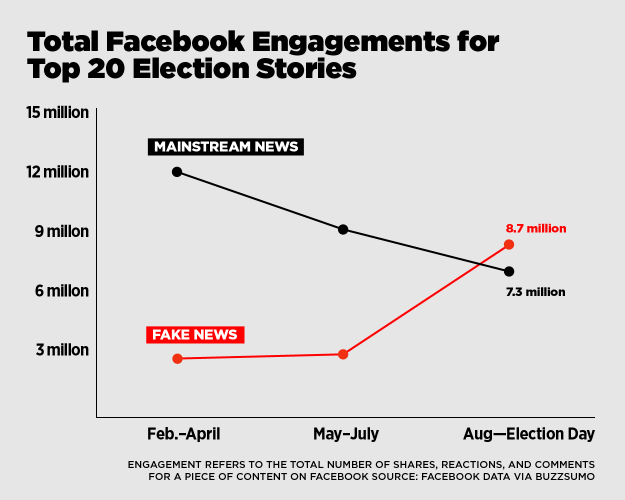 During these critical months of the campaign, 20 top-performing false election stories from hoax sites and hyperpartisan blogs generated 8,711,000 shares, reactions, and comments on Facebook. Within the same time period, the 20 best-performing election stories from 19 major news websites generated a total of 7,367,000 shares, reactions, and comments on Facebook. This social media pro-Trump engagement results from a tsunami of fake news stories, or so Craig and others claim. Bwahaha. The mainstream media’s accusation that news fakers gave the election to Trump is laughable. Considering how anti-Trump was mainstream news reporting during the same time period, many Americans sought information elsewhere and from people they trusted—or so I assert. Look for yourself, or just search your memory. The amount of anti-Trump news reporting following the nominating Conventions escalated by many times. Remember those Clinton endorsements, like the New York Times in late-September or the Washington Post in mid-October. By advocating for Clinton and against Trump, the Fourth Estate drove many citizens to seek information elsewhere, and they found it. To repeat: The success of so-called fake and partisan pro-Trump news directly derives from the mainstream media’s failure to be objective. To engage the majority of Americans. We journalists made the same mistake the Republicans made, the same mistake the Democrats made. We were too sure of our own influence, too lazy to bother hearing things firsthand, and too in love with ourselves to imagine that so many people could hate and distrust us as much as they apparently do. And now the same professionals who deliberately censored by their reporting bias want to censor competitors who practice free speech. I don’t see anywhere in the First Amendment or the Free Press Clause any mandate that only truth is free speech. For good reason, when so much in politics is subjective and this election cycle is rife with partisan advocacy journalism, regardless of political party or Presidential candidate. The news orgs acting in righteous indignation are self-serving for another reason. The same economics that supports the New York Times or the Washington Post enriches the so-called fakers. There is only so much in available ad revenue or consuming audience to go around. The number is finite. These successful upstarts take revenue from the establishment. Digital advertising spending will top $194 billion this year, according to eMarketer. Mobile: $109 billion. In both categories, combined, Google and Facebook take the largest chunks: 45.7 percent and 54.7 percent, respectively. Consider Caitlin’s story. “Right now I make like $10,000 a month from [Google] AdSense”, self-proclaimed fake news writer Paul Horner tells her. Not to nitpick, but, if he writes false stories can anything he says be believed? His bounty, and others like him, is revenue that might go to mainstream news orgs (or new media). Is their sudden assault on so-called fake news really about protecting the public trust or eliminating a competitive threat? Yesterday, Facebook CEO Mark Zuckerberg announced a combative strategy that includes “disrupting fake news economics”. Google promises to close AdSense to the fakers. But who, or what, decides what’s factual or not? By what biases? Again, my contention is that mainstream media practicing advocacy journalism masked as objectivity is as guilty bastardizing truth. Should Facebook and Google, as providers of the major digital advertising platforms, censor information? That is: Curb free speech? No. As a journalist seeking to reveal truth, I look unkindly on purveyors of falsehoods. But they nevertheless practice the same free expression protected by the First Amendment. The Fourth Estate seeks to preserve its own status-quo position by way of censorship. How shameful. Mainstream media’s vested interest censoring so-called fake news is even greater. The Fourth and Fifth Estates exist in symbiotic relationship that the fakers jeopardize. News orgs need platforms that contextually reach audiences wherever they may be. These same platforms want the content, and Facebook courts publishers to get it, as example. Where do most Americans find news, regardless the source: Search or social. For example, according to Pew Research, 67 percent of U.S. adults use Facebook and 44 percent get news there. Additionally: “Of those who get news on at least one of the [social media] sites, a majority (64 percent) get news on just one—most commonly Facebook”. There are reasons why social sharing icons are prominently placed on news (and many other) websites. But the social media relationship is somewhat precarious. As stated in the previous subhead, mainstream media also risks undermining of its authority—from citizen journalists, new media upstarts, agenda advocates, and so-called fakers, among others. Strangely, by ethical erosion, the Fourth Estate is in part responsible for fake news’ success. Accuracy in journalism has decayed as newsrooms increased reliance on social media to source stories. In September 2010, I railed against a change in Associated Press policy permitting the crediting of bloggers. I warned that the practice “opens way for lazy reporting and undermines the news organization’s reputation and credibility”. I am a real pisser about accountable sourcing, which citing blogs as primary sources sabotages. Please read my analysis “The Four Bad Habits of News Sourcing“, if you are a reporter. Social media is a wonderful tool for crowdsourcing news, particularly when citizen journalists can be where you can’t—like videoing live from one of the venues attacked last week in Paris. But you still have to contact the source, make every reasonable attempt to authenticate the posted digital media or text information. Every journalist’s fundamental responsibility is following the Prime Directive: “Write what you know to be true in the moment”. If you didn’t contact the source directly, you don’t know what’s true. This is ever-more important when sourcing social media posts. 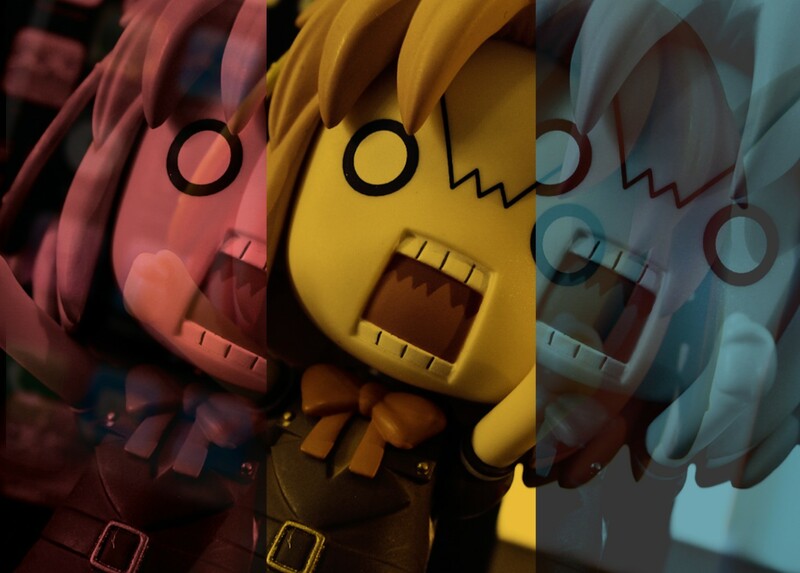 Authentication is principle to accuracy. Particularly when an organization like the Islamic State of Iraq and Syria is involved, sourcing should be careful, because the group is active on social media and can use it as vehicle for disseminating misinformation. As an editor, I tell reporters, always ask before doing anything else: “Who benefits?” The answer can help you determine the source’s trustworthiness. To reiterate: Mainstream news media is ingratiated with social media, where stories are shared, creating a feedback loop and also generating clicks that sell advertising. Journalists sometimes spread fake news by sloppy sourcing, often gathered from sites like Facebook or Twitter, where gossiping is one major liked or shared commodity. At the core, pure, plain, and simple: Economics. Nate Dern’s December 2014, satirical Funny or Die post “The First Rule Of Web Journalism Is You Don’t Fact Check Web Journalism” is a frighteningly accurate set of guidelines for writing fake news, regardless the source. Snippet, relating to the economic motivations: “The eighth rule of web journalism is that if it’s too good to be true, you have to post it. The story goes up. It goes viral. It’s revealed to be fake. The apology goes up. The apology goes viral. You forget about it in a day and we’ll do it again in a week”. Across social sharing sites, fake news is the lifeblood of the media in 2016. The mainstream created the soil in which so-called fakers flourish. Oxford Dictionary’s Word of the Year 2016 is “post-truth“, which is defined: “Relating to or denoting circumstances in which objective facts are less influential in shaping public opinion than appeals to emotion and personal belief”. The word is scarily and sadly appropriate. I have been on the World Wide Web since early 1994, back in the Mosaic era, before Netscape entered public beta. Then, the Internet promised an epoch of openness and communication. But 22 years later, reality is something else: More and more people go online to confirm what they believe rather than to expand their viewpoints. So-called fakers feed off—as do mainstream news media orgs, I contend—confirmation bias shares so commonly appearing across Facebook, whether actively placed into News Feeds by people and entities or generated by machine-learning responding to user activity. While mechanisms may differ, the concept applies to lesser-successful services like Ello, Google+, Tumblr, or Twitter, among others. Think of social media not so much as a place to open minds but to close them, by reinforcing beliefs among the like-minded. Confirmation bias is Facebook’s economy—whether user content, likes and other interactions around it, or contextual advertising that generates real revenue. Election 2016 news shares, some of which were unquestionably fiction presented as fact, spotlight longstanding happenstance. There’s nothing new about so-called fake news, just the outcry from mainstream media caught in its own confirmation bias bubble about Hillary Clinton’s certain victory. Mmm, therein is another veiled reason why the mainstream media seeks to censor so-called fake news. If journalists regularly source, often unauthenticated, blogs and social media sites, they can in turn unintentionally propagate fake news to broader audiences; yes, such that occurred during the Presidential election. I’m unsympathetic. Reporters should treat social media posts as unreliable until, or unless, authenticated. “Verify first, post later” should be the practice. But in a market of fixed advertising, but overwhelming amount of content, there’s a rush to scoop that Twitter post or crazy cat video. I highly recommend New York Times analysis “How Fake News Goes Viral: A Case Study” by Sapna Maheshwari; dateline today. She explains how an unvetted tweet about paid-protestors opposing Donald Trump went viral. The source isn’t a journalist, and he was mistaken. I acknowledge that actual fake news can be difficult to separate from the factual, which is all the more reason for journalists to make sound sourcing practices a way of work-life. Three days ago, BBC posted a seven-question fake news quiz that I encourage you to take. I only answered two Qs correctly. Gulp. I took the BBC fake news quiz and wrongly chose 5 out of 7 questions. Live document “False, Misleading, Clickbait-y, and/or Satirical ‘News’ Sources“, created by Merrimack College prof Melissa Zimdars, attempts to identify and categorize so-called fake news sites. Because a Google Doc project like this one might become a dead link in a few years, I provide Ken Doctor’s informative background story written for Neiman Labs as backup. Also, as a work in progress, the document is changing. When I started drafting this analysis three days ago, there was a list of offending sites, which has since been removed “in order for it to be transferred to and expanded on in a more permanent, dynamic, and collaborative home”. I am familiar with almost none of the sites on the list, which, again, is presently unavailable. Among the notable exceptions: Satirical The Onion and ultra-conservative Breitbart News—the latter because my Trump-supporting Frak That! podcast cohost Randall Kennedy has sourced it so often I placed a moratorium against its use. Breitbart is clearly partisan—and I wisely distrust the accuracy and accountability of at least some of its news reports. But is Breitbart a fake news site? The answer’s importance cannot be overstated. Randall’s answer would be “No”, for sure (We had some discussion). Liberal lovers would disagree, based on their reactions across the InterWebs. Breitbart practices advocacy journalism, by my estimation, and so I question accuracy and objectivity; I apply the same skepticism to the news stories showcased in the first subhead, BTW. The point: What qualifies as fake news is disputed, and that should caution Facebook, Google, or any other content distributor about censorship. That said, FactCheck.org offers guidance on how to “spot fake news“. Melissa gives some outstandingly insightful bullet points in her Google doc that apply to the mainstream media. One that punches forth my biggest gripe as an editor: “Some news organizations are also letting bloggers post under the banner of particular news brands; however, many of these posts do not go through the same editing process (ex: BuzzFeed Community Posts, Kinja blogs, Forbes blogs)”. If the content isn’t vetted, it might spread misinformation! Like legitimately fake news. Oh, yeah, and I get so angry when seeing sponsored advert posts alongside curated editorial content, such that it’s not obvious one is separate from the other. That is fake news. I propose a different meaning to Oxford Dictionary’s Word of the Year, not as noun but verb-noun combo: The Fourth Estate must return to journalism basics: Post truth, vetted and sourced; at the same time, abandon the censorship crusade against so-called fake news. Mainstream media has lost trust with many news consumers: Should anyone be surprised that they seek out sources they trust—like-minded friends, family, coworkers, or neighbors—shared across social media? Journalists, give them reason to trust you! Sir, I think you’re missing the point, for all your words. It’s not the dissenting (or even outright fraudulent) voices, as such – it’s that the “fake news sites” represent themselves as something they are not – for example, to high school boys in Texas prese ting themselves as the “Denver Gazette”, thereby giving themselves a false air of legitimacy. I get your point, Tracy. Thank you. But this fake news phenomenon isn’t new. The timing of the outrage demands introspection, especially when the news media (and pollsters) so misread election trends, and afterwards so much blame goes to fake news sites. Also, I am a journalist confounded by fake news generated by professionals, for: failing to properly source; mixing non-editorial content with curated reports; posting rumors (which can drive up valuable pageviews).